HIGH QUALITY RESIN POOL HAS A HUGE 10” TOP RAIL & WILL NOT RUST OR CORRODE. SALT WATER FRIENDLY! Beautiful and contemporary style combined with high-tech materials and designs make the Cozumel™ the finest above-ground pool on the market today. Designed and manufactured by one of the world’s leading pool manufacturers, this pool will provide many years of family fun. Manufactured of composite materials that make Cozumel’s™ structure - top rails, bottom rails & uprights – impervious to corrosion. Injection molded top rail is stronger and better looking than cheaper extruded rails. Top rail is a big 10”, giving this pool a graceful look that will never rust or corrode. 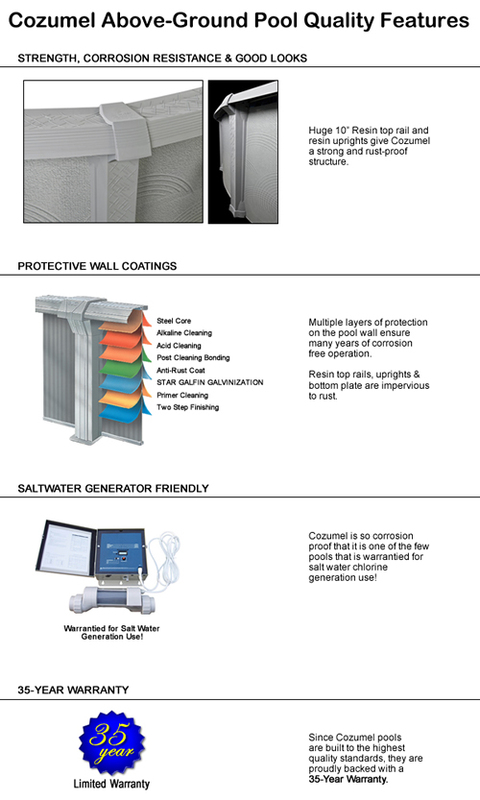 Cozumel™ is so protected against corrosion that it is warrantied for use with SALT GENERATION SYSTEMS. Cozumel™ is a big 54” deep, which means extra fun for the whole family! Beautifully made, structurally strong, corrosion proof Cozumel™ is backed by a 35 year Warranty. Comes with a step-by-step installation manual.